The house at 1361 Fairfield Beach Road is on the market for $1.5 million. 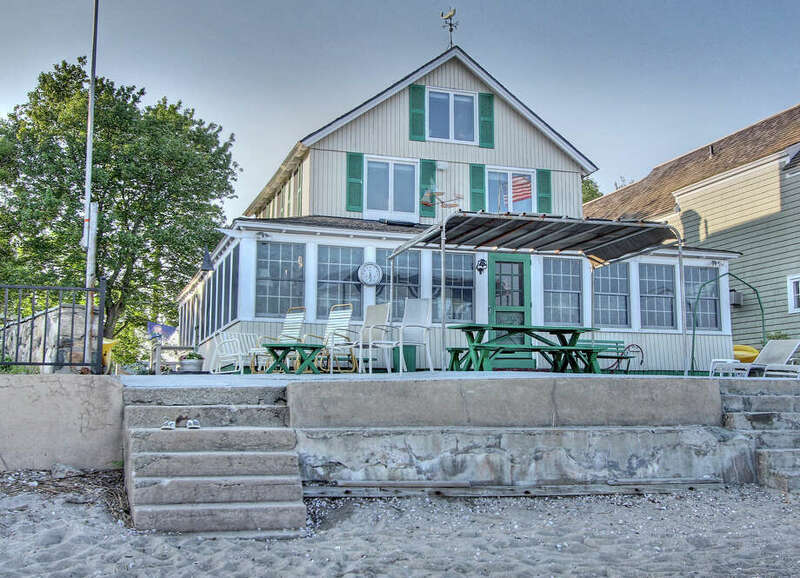 It's hard not to linger outside the vintage Colonial beach house at 1361 Fairfield Beach Road taking in the charm of this property, as well as the surprise that so much that adds to its appeal is compressed into this 0.18-acre waterfront site. It has a lawn -- small though it may be -- and flower beds filled with blossoming perennials not often seen beachside. It has Japanese maple trees and a one-car garage topped with a rooster weathervane and plenty of off-street parking. That's a rare commodity in a beach community. This property has a paved driveway that can easily accommodate four or five cars and there are three more parking spaces in a second parking area along the street in front of the house so entertaining is an option. The front lawn also features a wide red brick path, split rail fence, vine-covered wood lattice, and one garden area completely covered with seashells instead of mulch, offering a hint at what awaits on the other side of the house. This property has 45 feet of direct waterfront on Long Island Sound and almost every one of its eight rooms enjoys an ocean view. Despite its proximity to the water, the property sits at one of the highest points on Fairfield Beach Road, which prevented it from any major damage from Superstorm Sandy. Placing this house on the market marks the end of a chapter for one family that enjoyed it for decades and makes way for another family to start creating its memories there. Built in 1908, this 1,116-square-foot house would be ideal for anyone who has an appreciation for the past. One person called it "the kitschy beach house we all knew, loved and grew up with." A family member said, "this is a home that is loved," and it shows. There are not many of such homes left. So many people tear down the charming little houses to make way for larger structures with stainless and granite features. It really is quite functional as is but, of course, it could be updated. The house is beige with dark green shutters and, unlike the garage's, its weathervane depicts a whale. The man who owns the house named it On the Rocks "because that's how he likes his drinks," his granddaughter wrote in a blog. The living room has wood paneled walls, one wall of red brick which houses the fireplace with a raised brick hearth and long wood mantle, and there is one exposed beam on the ceiling. Around the corner of this L-shaped space is the dining room with a built-in china cabinet. Both rooms have access to the large wrap-around enclosed porch, which adds 800 square feet of living space to the house. In the living room it's through sliding doors. There are skylights on the porch and a door to the side yard. Near the front entrance of the house there is a separate door to a shower so people don't have to track beach sand into the house. An interior door goes from the shower to an area of the porch that has a half bath. Although the kitchen is small it does have an eat-in area. It has several built-in closets and a laundry area. A large utility room goes the length of the house from the kitchen to the porch. On the second floor there are three bedrooms, one of which is small and could serve as an office or even be converted into a walk-in closet or dressing room. All three rooms have paneled walls and wall-to-wall carpeting. The third floor has one good-sized bedroom with a half bath. In the backyard there is a large patio with stairs to the beach and the water. Penfield Reef Lighthouse is in view from the patio. For more information or to set up an appointment to see the house contact Becky Gangemi of William Raveis Real Estate at 203-913-0211 or email her at gangemib@raveisre.com.